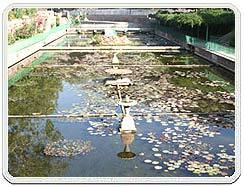 Mandore Gardens 9 km from Jodhpur, Mandore was once the capital of Marwar. The wide gardens with high rock terraces houses the ruins of the former capital along with the cenotaphs of Jodhpur rulers, the most remarkable being the memorial of Maharaja Ajit Singh. Its highlights comprise the graphic Hall of Heroes, a rock wall with high relief, bright paintings depicting scenes from the lofe of local heroes such as Pabuji and Chamunda and crowded current holy place of 30 crore gods. Mandore Gardens also provide the perfect venue for the much-famed Marwar Festival. The highlight of the Mandore Gardens include the graphic Hall of Heroes, a rock wall with high release, brightly painted depictions of local heroes such as Pabuji and Chamunda and crowded modern shrine of 30 crore gods. Fairs in Rajasthan are mythological in nature, relating to gods and goddesses. They are even celebrated to commemorate the brave deeds of medieval heroes. Mandore Gardens provide the perfect venue for The Marwar Festival, held in memory of the heroes of Rajasthan. The festival is celebrated in the Hindu month of Ashwin (Sept.-Oct.) in Jodhpur, the former capital of Marwar Province.